Locals went in a tizzy clicking photos with their impersonators, Howard X and Dennis Alan, ahead of a meeting between the real world leaders. They even participated in ‘real summit’ eating chilli crabs during a whacky and uncanny photo-op, walking about in Bugis Junction. The historic peace summit between US President Donald Trump and North Korean leader Kim Jong-un in Singapore is scheduled on June 12. But the excitement in the port city beyond diplomatic relationship has escalated in the last couple of week. And hours before the two leaders landed in the country, two others stole the show. Yes, locals went in a tizzy clicking photos with their impersonators, Howard X and Dennis Alan, ahead of a meeting between the real world leaders. The famous duo, who are musicians — earlier grabbed headlines for crashing the 2018 Winter Olympics and filming videos outside the US consulate in Hong Kong. But on Saturday, locals went berserk as they participated in ‘real summit’ eating chilli crabs during a whacky and uncanny photo-op, walking about in Bugis Junction. They were also seen bromancing during their visit to Merlion Park, a popular tourist destination in Singapore, as scores of people throng the venue to take selfies with them. 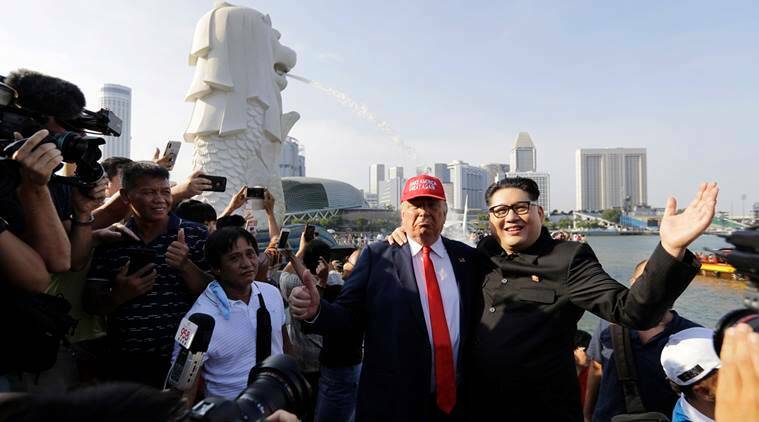 The summit between US President Donald Trump and North Korean leader Kim Jong-Un will be on Singapore’s southern island of Sentosa. Security for Kim Jong Un at his first meeting with Trump is expected to be ultra-tight, with measures likely surpassing those seen at the April 27 inter-Korean summit, experts and analysts say.